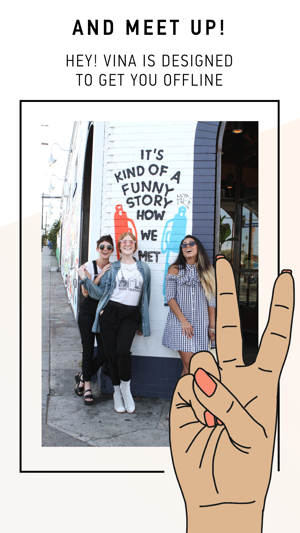 Your fave app for women's friendship! 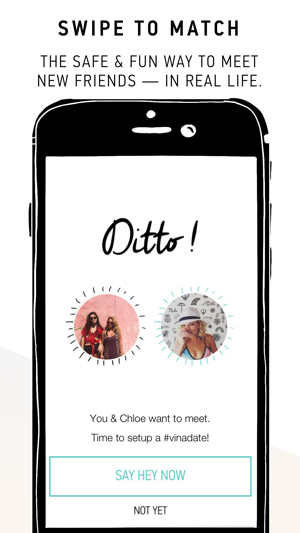 Swipe to meet new friends, join communities, take quizzes, & read awesome articles to live your best life. Hey! 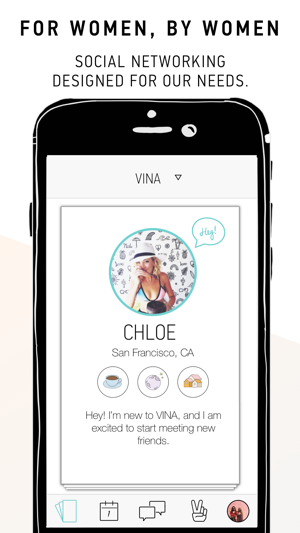 VINA is the social discovery app just for women. You can tap into wherever you are in the world (or in your life!) to meet up with friends when you travel, move to a new city, transition life phases, or simply want to grow your social circle. Friend finding made safe, easy, and fun. Yay! — SIGN UP WITH FACEBOOK OR INSTAGRAM (new) - we use this to confirm your gender and find people who you should know. — GET INTRODUCED - once you have a match, you get introduced to a new potential friend. We make it easy to meet with a personalized intro from Olivia from VINA. 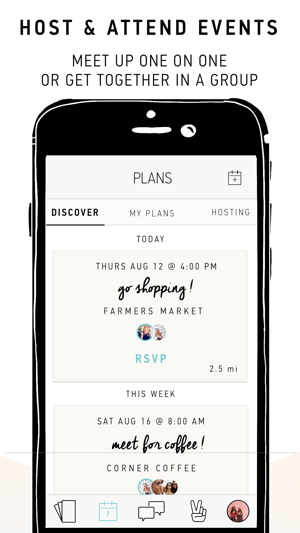 — MEET UP - Use our handy Plans feature to post a private invite to meet up or make a public invite to invite everyone in your area to join... the most important part is meeting up IRL! 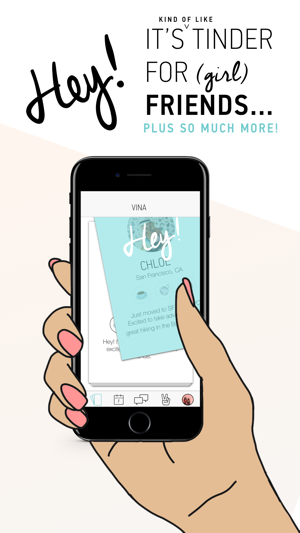 — KEEP IN TOUCH - you can add your matches and facebook friends to your VINA List to group chat, make plans, or all kinds of stuff. — BECOME A VIP - match faster and easier by upgrading to VINA VIP! You can now upgrade with a paid subscription to preview who swiped right on you... more premium features to come soon, too! 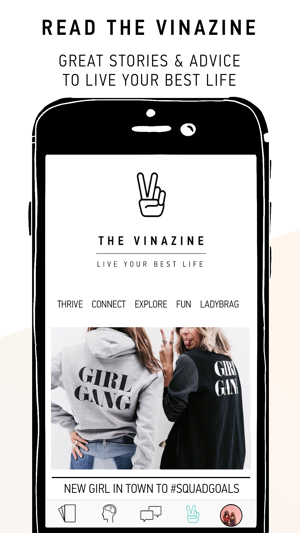 — READ THE VINAZINE - read stories and advice to help you meet more friends, navigate adulting, and live your best life. Stories written by members of the VINA community for the VINA community. — TEACH ME HOW TO VINA - We made some improvements to our tutorials in the app. — BUG OUT - as always removed some (lady) bugs, made some beauty enhancements, and got rid of some (party) crashes. - One thing I did notice is that blocking someone doesnt work? - Also, there is no block list so you cant even go to see who you’ve blocked/ unblock someone (if blocking them was an accident). - ALSO would be nice to see all the “Hey’s” you sent. To also have the option to take back our “hey” would be great too! Thanks for reporting this and sharing your feedback! Sent this to our engineers and we are looking into issues with blocking ASAP! Great app but some bugs to be worked out!!! 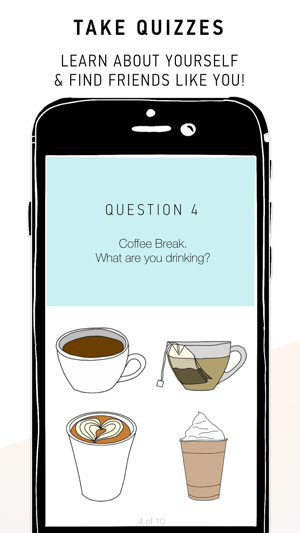 I love the idea of this app. Especally for the area I live in, it is super hard to meet people outside of your work circle. So, excited to start meeting new friends! However, at one point it said that I had 106 heys so I was so confused with why I only had like 3 matches. I started swiping right on almost everyone and only got like 3 more matches. Then I looked at my "Heys" and I only had 46, so something is super buggy with the app. As well, I got a message from someone inviting me to go to an arts & crafts fair but it seemed like it was about a week late as the fair was the weekend before. Then I responded to the person and have received nothing back. Please fix the bugs!!!!! Also, I don’t like that I have to sign in after every update like it doesn’t remember me. I accidentally hit instagram to sign back in and it wouldn’t let me go back to sign in through Facebook. That is annoying. Please fix these things!